There are only three second-hand bookshops left in Charing Cross Road, though there are a few more in Cecil Court that leads from that road to St Martin's Lane. This is a grave problem for those of us who are addicted to second-hand books and the shops that house them. I hate to have to admit to it but buying them on the net without the happenstance aspect to the whole procedure is not the same. Still, there is Any Amount of Books, open most days till 9.30 in the evening, somewhat ramshackle inside and with boxes of cheaper paperbacks outside. Browsing through its shelves one evening I came across a completely new copy of a recently published book, The Conservative Turn by Michael Kimmage, a dual biography and analysis of the role of two of my great heroes: Lionel Trilling and Whittaker Chambers. Professor Kimmage follows the two careers from their differing childhoods, joint time at Columbia University and subsequent divergence - Trilling into liberal academia, Chambers into Communist espionage, then journalism and the notoriety of the Hiss case. Between them these two people, argues Professor Kimmage, created the conservative intellectual atmosphere that is still present in the United States, despite the odd political aberration; Trilling by turning liberalism away from support of Communism and Chambers by laying the foundation of modern conservatism. I am still in the early stages of the book but I shall be interested to see how the author argues that liberalism has remained the middle of the road, anti-Communist movement that Trilling had fostered. Reports on the book to follow. The Kremlin, August 23, 1939 though the document was dated August 24. Tory Historian was very excited at the news, which, for some reason was only on AFP, in English and in French, that a cache of early twentieth century films were found in Poland, in a parish building in the city of Sosnowiec. There were these two metal boxes, left by the film buff priest, Father Jerzy Barszcz, who had been collecting films since just after World War II until his death in 2004. Or so it appears from the story. There are a few gaps in it, though. For instance, where are the more recent films? He cannot have collected only early twentieth century ones. Did he ever show the films? Why did it take five years after his death to open those metal boxes? And why were some of them dubbed or sub-titled into Czech, as the French version of the story has it? All of that pales into insignificance at the news that one of the films appears to be "a 1929 German version of the Sherlock Holmes adventure "The Hound of the Baskervilles" by Richard Oswald", which was officially considered to be 'lost'. How terrifying must that be. After far too long an interval in posting (memo to self: must do better) Tory Historian can think of nothing better or more important than post a paragraph from Edmund Burke's famous acceptance speech to the electors of Bristol, delivered November 3, 1774. This paragraph is very apposite to the debates that are going on now about the role and task of MPs though we must remember that the question of renumeration did not arise at the time. Certainly, Gentlemen, it ought to be the happiness and glory of a Representative, to live in the strictest union, the closest correspondence, and the most unreserved communication with his constituents. Their wishes ought to have great weight with him; their opinion high respect; their business unremitted attention. It is his duty to sacrifice his repose, his pleasures, his satisfactions, to theirs; and, above all, ever, and in all cases, to prefer their interest to his own. But, his unbiassed opinion, his mature judgement, his enlightened conscience, he ought not to sacrifice to you; to any man, or to any sett of men living. These he does not derive from your pleasure; no, nor from the Law and the Constitution. They are a trust from Providence, for the abuse of which he is deeply answerable. Your Representative owes you, not his industry only, but his judgement; and he betrays, instead of serving you, if he sacrifices it to your opinion. Parliament is not a Congress of Ambassadors from different and hostile interests; which interests each must maintain, as an Agent and Advocate, against other Agents and Advocates; but Parliament is a deliberative Assembly of one Nation, with one Interest, that of the whole; where, not local Purposes, not local Prejudices ought to guide, but the general Good, resulting from the general Reason of the whole. You chuse a Member indeed; but when you have chosen him, he is not Member of Bristol, but he is a Member of Parliament. If the local Constituent should have an Interest, or should form an hasty Opinion, evidently opposite to the real good of the rest of the Community, the Member for that place ought to be as far, as any other, from any endeavour to give it Effect. I beg pardon for saying so much on this subject. I have been unwillingly drawn into it; but I shall ever use a respectful frankness of communication with you. Your faithful friend, your devoted servant, I shall be to the end of my life: A flatterer you do not wish for. On this point of instructions, however, I think it scarcely possible, we ever can have any sort of difference. Perhaps I may give you too much, rather than too little trouble. Of course, Burke was not a Tory but a Whig. Does that make a difference? Tory Historian is not really one of the shooting fraternity but has known many people who are. Therefore, the Glorious Twelfth (which is not called that by anybody who actually shoots on that or any other day) has to be marked on this blog. It seems that the beginning of it lies in the Game Act of 1773, which laid down that the hunting (or shooting) season for red grouse should run from August 12 to December 10. Wikipedia, which gives a reasonable summary, gives the Game Act of 1831 as the start of the tradition. It certainly tightened and consolidated the legislation. For the sake of tradition as well as a healthy rural economy Tory Historian hopes that there will be many more grouse-shooting years, some good, some not so good. Also, let's face it, grouse tastes good. Looking for something different Tory Historian found these two excellent sayings by Charles de Montesquieu, well, Charles-Louis de Secondat, baron de La Brède et de Montesquieu, to give him his full name, who lived from 1689 to 1755 and was a man of many parts, as well as author of "The Spirit of the Laws", a crucial political text. What can one add but: discuss. This review is part of a series on books that might be of interest to those interested in conservative history. “In Denial” by John Earl Haynes and Harvey Klehr deals with the shock the American historical establishment received when the brief opening of the KGB’s archives and the publication of the Venona documents showed that the accusations about the CPUSA and Communist infiltration in the American government were true; it shows the largely dishonest and bullying manner in which so many historians tried to deny the truth and to continue to produce propaganda rather than history in order to “educate” the younger generations in their own mindset. Though the story starts in the nineties when temporarily the KGB allowed some western historians limited access to its archives and the Venona decryptions were finally declassified and released for public consumption, there was a long prelude to it. Above all, most historians took what is now known as the traditionalist line about Communism though many hummed and ha-d about the domestic variety of it. As against that, the supposedly serious media and some parts of the intellectual community continued to proclaim the innocence of Alger Hiss, the Rosenbergs, and anyone else who had been shown to be a Soviet agent. Then in the late seventies a determined and growing group of younger academics who, as they became more senior, made sure that only people who agree with them followed them up the ladder, decided to “revise” the study of the Soviet Union. According to this (and I recall not only reading books and articles but hearing people solemnly proclaiming the new trendy ideas) there was really not that much difference between Western democratic and Communist systems. There were bureaucracies in both and both had a kind of pluralism. Mind you, the Communist pluralism was somewhat different in that it meant different organizations agreeing with the party line. Old-fashioned historians like Richard Pipes and Robert Conquest were attacked and abused and their findings dismissed. There could not have been that many people murdered in the Soviet Union; Stalin could not have ordered the purges – it was a bureaucracy getting out of hand; and so on. Sometimes it proved to be necessary to disregard certain events such as the Katyn massacre. This was not, as the authors point out, “a perverse pastime”. After all, there was never the slightest attempt on the part of a single reputable historian, department or publication to “normalize” views of the Nazi regime. The revisionist historians who came out of the various New Left movements deliberately wanted to underplay the notion that Communism was a totalitarian system. Even more importantly, many set themselves the task to re-write the history of the CPUSA, its links with the Soviet Union, total obedience to the Comintern line and the various Soviet agents whose work it organized and facilitated. For some years they could scream abuse at all those who pointed out that Chambers’s account was well supported in court by material and personal evidence and, indeed, repeat the canard that he was completely neurotic and unbalanced (as described by two psychiatrists called by Hiss’s lawyers who had never met him). They could pour contempt on the likes of Elizabeth Bentley and insist that every single person who had ever testified about Communists must have been evil, venal, hysterical or pathological. Sometimes all of those things. Then the archives of the former KGB were briefly opened and western researchers were allowed to look at documents, write histories and even reproduce those documents in original and in translation. Oh dear, dear, dear. It appeared that much of what the CPUSA and the various spies had been accused of was actually true. Yes, dear children, Alger Hiss was, indeed, a spy, though he worked for the GRU not the NKVD, later KGB. And the Rosenbergs, together with Ethel’s brother, who has since given fairly accurate accounts of what had happened, were successful Soviet agents. Harry Dexter White, Lauchlan Currie, Laurence Duggan, they were all spies. And there were many more. Finally, came the Venona documents, decryptions of some of the heavy Soviet exchange between the embassy and the various heads of espionage departments back in Moscow during the war, when the two countries were supposedly allies. The bulk of “In Denial” is taken up with the various methods used by the revisionists (some of whom recognized and acknowledged that they had been wrong) to evade the truth, dismiss evidence, lie about facts, pervert historical studies. In the process the various academics (most of whom are not particularly well known outside their own establishments), supported by the media and, always, Hollywood tried to reduce the importance of the CPUSA at the same time as pretending that it played an important part in the development of the American left while trying to deny its absolute allegiance to the Comintern. Through it all runs the one mantra endlessly repeated by these academics – however bad Communism was, however dishonest the agents might have been, the worst and most evil of developments in American history has been “McCarthyism” by which they designate all opposition to Stalinism and Communism, whether it came from the right or the left. In fact, in true Stalinist fashion, these people hate left-wing opponents far more than the right-wing ones. Klehr and Harvey compare this dishonest and destructive approach to Communism, domestic and foreign with attitudes to Nazism with the usual results we have all noted. But they also, interestingly, compare the last-ditch supporters and glorifiers of American Communists to those who have attempted to create a romantic image of the Confederacy, arguing that just as one can never quite get away from the problem of slavery the other can never quite get away from the problem of Stalinism. Revisionist historians have openly explained that they do not consider it necessary to be objective or to look at facts. History, in their view, is a method of indoctrinating the next generation to continue the fight for a socialist America. To that end they can use Soviet methods in their debates and discussions though, to be fair, there are times when even the worst of them have to admit some of the truth, hard though it is. To what extent have they succeeded is an important question. Or have Klehr, Harvey, Weinstein and others put a spoke in their collective wheel and we shall see a new generation of historians reverting to their proper activity? Not a round date but here is a slightly unusual photograph connected with Hiroshima. 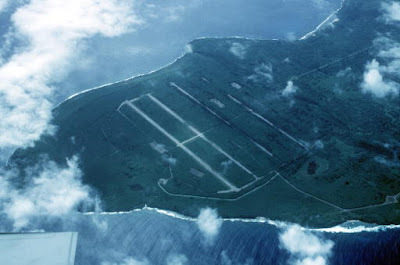 This is an aerial view of the USAAF North Field on Tinian Island, from which the B-29 bombers flew. That included the ones to Hiroshima on august 6, 1945 and Nagasaki 1945. The picture comes courtesy of DefenseImagery.mil, the Department of Defense's prime image website that is open to all. Hiroshima and Nagasaki bring out a great deal of wailing and gnashing of teeth. Tory Historian feels no compunction at all in linking to this article on American Thinker, which reminds us all of the many thousands of lives thate were saved by the swift conclusion of the war in the Pacific. Just how silly is this season? Ah yes, Tory Historian is told, the silly season. Nothing ever happens in late July and August. Oh no? Well how about a few random events from the twentieth century? Hmm, some silly season that turned out to be. Let's try a few more dates. Not much of a silly season there, either. From the point of view of historic symmetry it would be nice to have a few events from 1989 that took place in the silly season. Alas no. The nearest is May 29, when the Hungarian border guards started dismantling the border with Austria, cutting the wire fences and lifting the mines. Perhaps, it is only important bad things that happen in the silly season.